Jordan Peele established himself as an intriguing new voice in horror with his 2017 breakout hit Get Out. Now, two years later, and fresh from taking home an Oscar for Best Original Screenplay, Peele is back with a new horror jam simply titled Us. The story is centered around a family who is on vacation at their beach house looking for some rest and relaxation. The husband Gabe (Winston Duke) is a laid-back kind of guy, but his wife Adelaide (Lupita Nyong'o) is incredibly uptight for some reason. They have two children, a girl named Zora (Shahadi Wright Joseph) and an energetic boy named Jason (Evan Alex). One evening after a day of fun at the beach, the family is visited by a group of strangers who bear an uncanny resemblance to themselves. These doppelgangers harbor a malevolence that threatens to tear the family apart. 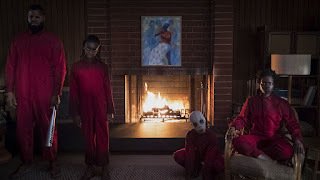 One of the most intriguing elements of Us is the fact that all the actors are pulling double duty as they play both themselves and their evil version. Lupita Nyong'o is absolutely outstanding as Red, her fiendish alter-ego. Speaking in a raspy voice she skulks around, wide-eyed and sinister emitting a vicious energy that steals every scene she is in. Her transformation is awe-inspiring and is the glue that holds the entire film together. 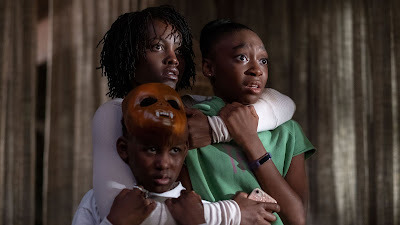 As excellent as her performance is, the rest of the cast puts in their best effort and thanks to Peele's occasionally hilarious dialogue, they are easy to empathize with and root for. I love how Peele's comedy roots are always peeking through the horror and you never know when a funny quip will catch you off guard during a tense scene. It never feels tonally inconsistent or forced. Social commentary takes more of a backseat in Us than it did in Get Out, but it is there if one cares to dig deeper under the surface. Us deals with class structure and the dichotomy between those who have everything and those who have nothing. There are people in this country who slip through the cracks, just barely making a living--all while being forced to watch everyone else enjoying their carefree lives from afar. During their first encounter with the doppelgangers Adelaide asks Red who they are. "We are Americans." Red replies with a rueful smile. We are them and they are us. Us is incredibly ambitious, but unfortunately that ambition comes with a price: lack of focus. The narrative is pretty messy and almost falls apart in the third act. There are a lot of grand ideas at play here, and Peele doesn't quite flesh them out enough. The surreal elements that he played with in Get Out (with the Sunken Place) are much more prominent, so how badly you need your stories tied into a neat little bow will affect your enjoyment of the film. These little abstract jaunts might turn off people expecting a more grounded horror film, but it also makes for some truly mesmerizing sequences. The score and soundtrack are excellent and it perfectly mixes classic hip-hop songs and haunting compositions from Michael Abels. Anthem, the main theme, utilizes creepy choral work and dissonant noise to great effect. There is also a fantastic orchestral version of I Got 5 on It that accompanies an intense scene that is genius in its execution. The cinematography is great and Peele proves yet again he has an eye for dynamic shots. One of the biggest issues this film has is the pacing as it drags too much in the third act and it feels about 15-20 minutes too long. Even with the issues with narrative and pacing Us is a compelling horror film with a lot of creativity and heart. The good aspects far outweigh the bad, and if you can suspend your belief enough to roll with some cinematic insanity you will have a good time.